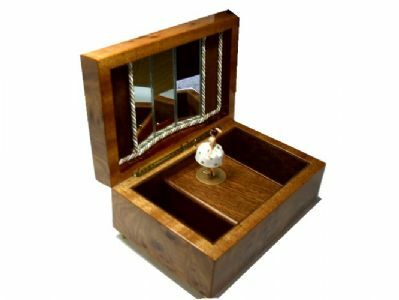 A beautiful musical jewellery box manufactured in Switzerland under the "Romance" brand by Reuge, the famous Swiss music box manufacturer. When the music box is opened the dancing doll elegantly twirls back and forth. 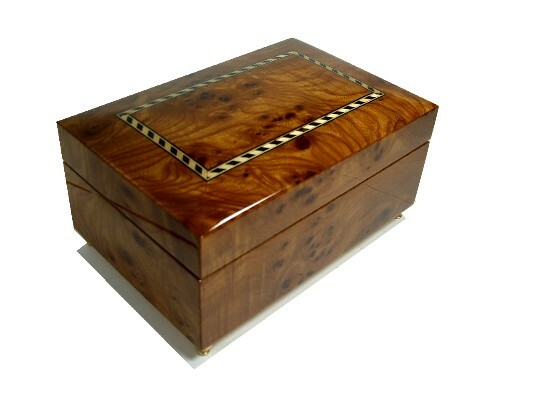 Finished in burr elm with an inlaid banding on the lid. Inside the lid are three mirrors to add to the dancing effect. Please note - although we take as much care as possible to show pictures of the actual products available, because this is a hand made product from wood, the colours may naturally vary slightly from those shown.